One of the most fascinating things about Rome, and something one gets a lot less of in Florence, is the very apparent layering of history. You see it on the city’s major hills, in the architecture that blends Roman and Renaissance, in the permanent excavations alongside major modern roads, in ancient capitals laid to rest on a grassy passageway. Some of these things we can easily see, but there are others that require someone to point them out to us. 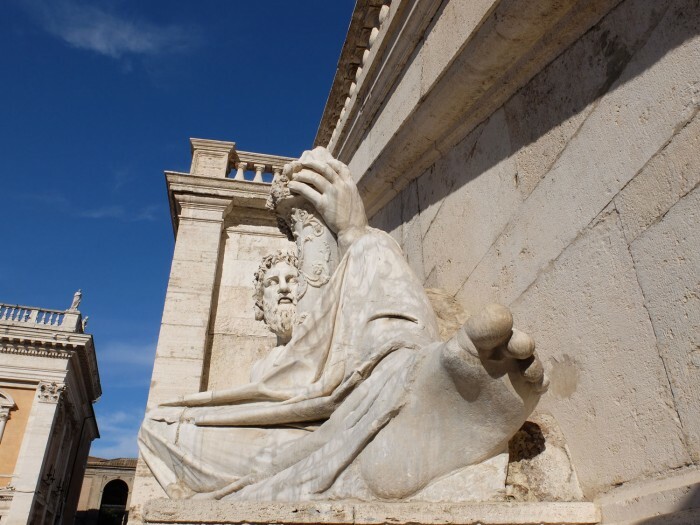 To be knowledgeable about Rome, it’s impossible to have just one area of specialty: you have to get a grasp on ancient emperors, kings, popes, antipopes and prime ministers. Luca De Angelis, an archaeologist, led us on through many of Rome’s areas and secrets with Through Eternity’s tour “The Secrets of Rome off the Beaten Path”, a tour that might be better titled “Rome in depth through its layers”. For we didn’t visit places a seasoned traveler would not go to so much as we approached them in a more detailed manner – one that went well beyond my own knowledge about Rome. You can’t get more central than the Capitoline Hill, yet there’s no question that this hill – one of Rome’s seven – hides many, many layers of history. Currently home to the Capitoline Museums as well as being the city’s seat of government, it’s mostly the ancient sculptures on display that remind us of this high point’s importance during ancient Roman times. It was home to major temples already before the Imperial Age, and was the center of the city’s government then, as it is now. The hill had two summits, and in between was considered an asylum, so that criminals who managed to reach this spot could automatically become citizens of Rome (thus upping the capital’s population). In a not-ideal combination of criminals and cash, the city’s mint was also located here (right about where there is a modern copy of a statue of Romulus and Remus and the she-wolf on a column), and across from this was a temple dedicated to Juno Moneta. The epithet Moneta comes from the word monere – to warn – and is related to one or two legends. The cutest one is that one of the main animals consecrated to Juno was the goose, and so geese were kept at her temple. When Gauls attempted to capture the Capitoline Hill in 390 BC, the geese made so much noise that the attempt was foiled. Hence the temple, previously just dedicated to Juno, became dedicated to Juno who warns. The mint was referred to in its proximity to this temple, ad monetam, eventually evolving into the modern Italian word for coin (moneta) and the English word, money. Today’s piazza takes on a Renaissance shape designed by none other than Michelangelo in 1536, dominated by the Palazzo Senatorio or city hall; on its central staircase, the artist placed two huge antique river gods (reminiscent of the Medici Chapels in Florence). 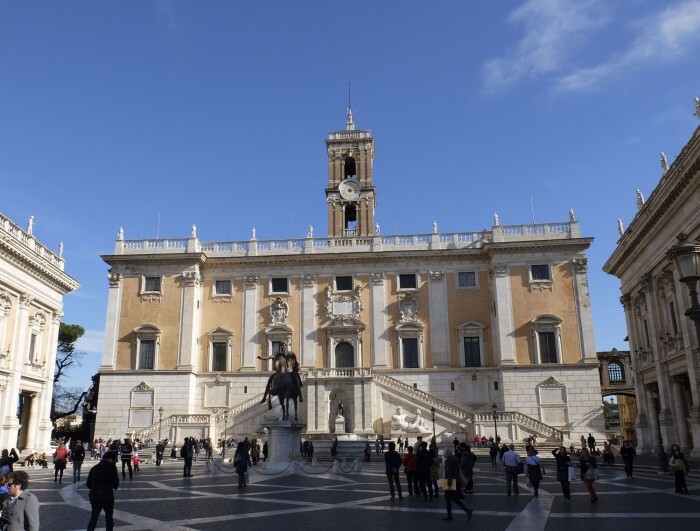 This building is flanked by two others planned or redesigned by Michelangelo, that now house the Capitoline Museums, and in the center of the piazza is a huge bronze equestrian statue of Marcus Aurelius. It’s the only statue of this type to survive being melted down over the ages because it was supposedly mistaken for a portrait of Constantine, the first Christian emperor (although the two men looked nothing alike). 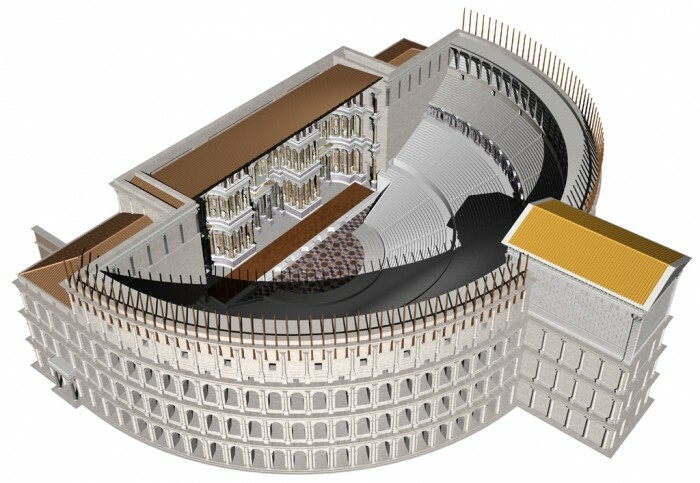 While forms of spectacle and theatre existed in ancient Rome as far back as the 4th century BCE, there were no permanent theatres for plays (unlike ampitheatres for gladiatorial combat and sports) until 55 BCE. The story has it that this was due to opposition by the senators out of concern for public morality, since some of the plays put on were of dubious cultural value – Luca told us about a popular pantomime in which the story of Leda and the Swan was told by placing a naked woman on stage and covering her with barley to be pecked at by birds, so it’s hardly Shakespeare. Mime and Pantomime were then, as they are now, some of the general public’s favourite ideas of a good time. Italian TV is a case in point. 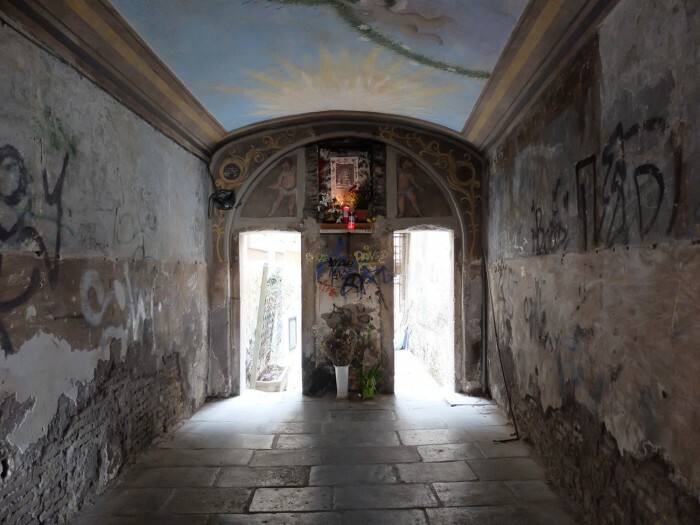 Now totally integrated into the shape of the urban space that grew up around it, we can still walk through a “dark alleyway” that may once have been one of the accesses to a seating area of the theatre, known as the Passetto del Biscione or via Grottapinta. As for the elaborate marble decoration of this building, not to worry – its pink and grey Egyptian granite columns found their way into the 15th-century Palazzo della Cancelleria nearby, like everything else that was conveniently “recycled” when the theatre fell into disuse. In the first century, Emperor Hadrian built himself a gigantic tomb, and a bridge across the Tiber to access it, that was so strategically located that it became a stronghold for the city already in the early Middle Ages. 100 years of emperors were buried here, but this didn’t stop later Popes from using and expanding the building for defensive purposes. Access to the inside of the building is through a helicoidal ramp that initially led to the central part of the tumulus which was likely used as a burial chamber. Square holes for pegs in the travertine and brick walls indicate where decorated marble slabs would have been attached, making this nicer than your average luxury hotel. In 1495, the Borgia pope Alexander VI hired Antonio da Sangallo the Elder to expand the building upwards, creating comfortable rooms and an even better place from which to look out over the city. The work was completed under Paul III and the direction of Sangallo the Younger. 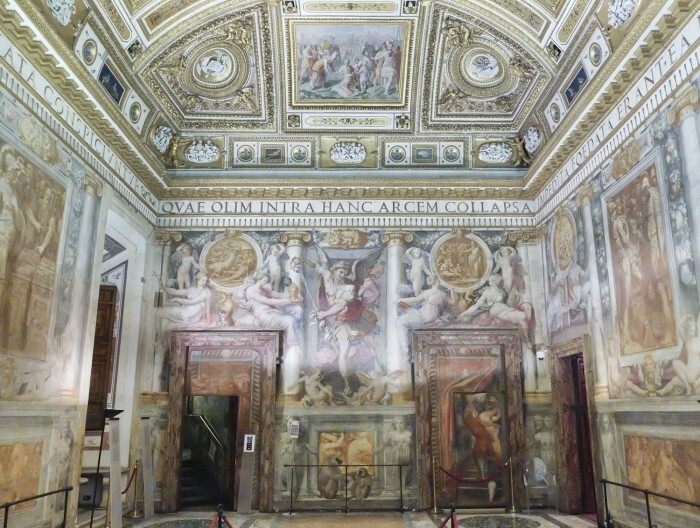 There’s a fabulous frescoed room by Perino del Vaga and an intimate bedroom containing a period papal bed. 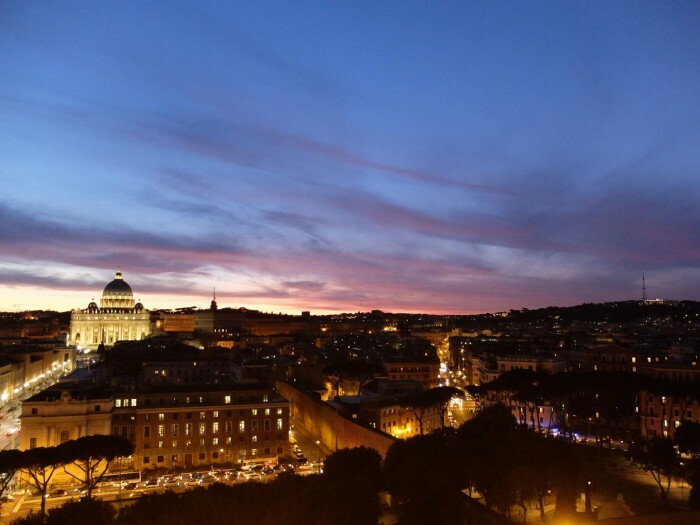 It’s a long walk to the top of Castel Sant’Angelo, which is visited by three quarters of a million tourists per year, but many of them don’t pause in the Renaissance rooms, heading, rather, to the top of the building for a 360 degree view of the city of Rome. From above, it’s harder to see the layers that characterize Rome, for which you need to dig deep, often below ground level. Enjoyed this article? Get more cool information like this directly from the source – check out the tour “The Secrets of Rome off the Beaten Path”. With thanks to Through Eternity for hosting me during this experience.